Provide comfort for the family of Rachel White-Reilly with a meaningful gesture of sympathy. Rachel Theresa White-Reilly, age 60, of Milford, passed away on Tuesday, February 5, 2019 in Yale New Haven Hospital. She was born on May 20, 1958 in Waterbury to the late Vincent and Lucy Pace Catapano. A dedicated wife, mother, sister, aunt, and friend to many Rachel was always going above and beyond to help anyone in need. She devoted her spare time to her daughter and stepsons’ various activities, bringing the Milford Senior Center members on trips to see Broadway shows, being a coach for the Global Messengers with Special Olympics, and loving her treasured cat Oliver. Rachel was employed as a bus driver for the Milford Senior Center for many years and loved her seniors. She leaves behind, her loving husband Edward T. Reilly, precious daughter Lucia White of Milford, stepson Shawn Reilly of Milford, stepdaughter Jennifer Reilly of Maui, HI, granddaughter Kayla Brainard, brothers Nicholas Catapano and his wife Cindy and Tony Catapano, sister MaryJo Downs and her husband Matthew, all of Milford, her brothers-in-law Richard Reilly and his wife Sharon of Milford, John Reilly and his wife Marilyn of Derby, and George French of Alabama, her sister-in-law Annie Fournier and her husband Mike of Milford, and many nieces and nephews. Besides her parents, she was predeceased by her first husband Robert White and sisters-in-law Tyynė Postel-Catapano and Rosemary French. Calling hours are Sunday, February 10, 2019 from 2pm to 6pm at the Smith Funeral Home, 135 Broad St., Milford. A Mass of Christian Burial will be celebrated on Monday, February 11th at St. Ann’s Church (St. Raphael’s Parish), Naugatuck Ave., Milford at 10am. Interment will follow in Kings Highway Cemetery. In lieu of flowers, donations may be made in her name to the Special Olympics, 48 Baxter Lane, Milford, CT 06460. 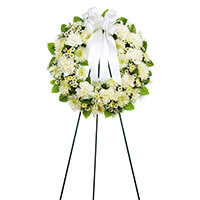 To send flowers in memory of Rachel Theresa White-Reilly, please visit our Heartfelt Sympathies Store. Tom, Andrea & Ryan, Ryan, Kevin, and Leah, and others have sent flowers to the family of Rachel Theresa White-Reilly. Our Deepest Sympathies go out to you Mary Jo and family. May God give you strength in the days ahead. Our love and prayers are with you and your family. Tom, Andrea & Ryan purchased the Open Round Standing Spray - All White for the family of Rachel White-Reilly. To the Reilly family sorry for your loss Rachel a good mom wife and a good friend she was well liked by all she loved helping with special Olympics she loved going to the dinner dance.